The St. Paul Fire Department now has three new Black firefighters on its roster – including its first new female firefighter in over 10 years. Brittany Baker, Brandyn Springsted and Dujuan Williams were sworn in May 11 at the Paul and Sheila Wellstone Center as part of the 19-member graduating class of the city’s Firefighter Academy. Gerone Hamilton, a 20-year veteran and chief of community relations, and several other Black firefighters from St. Paul and Minneapolis attended last week’s public ceremony to support their new comrades. In 2013, former St. Paul Mayor Chris Coleman established a Fire Department Diversity Task Force of City officials, firefighters and community folks to look at the City’s recruiting strategies, minimum qualifications, application, and training and hiring processes. Currently, 10 percent of the St. Paul firefighters are Black, and 18 females make up the 428-member group. Becoming a firefighter isn’t easy – one must first pass a physical performance test, then a written test, and be state EMT (emergency medical technician) certified or working toward certification. Then the individual gets put on a waiting list to be called. If finally accepted, participants go through 16 weeks of intense training. It was almost a decade-long process for Baker, who became St. Paul’s first Black female firefighter since Toni Terry’s retirement in 2007 and the second in the history of the department. 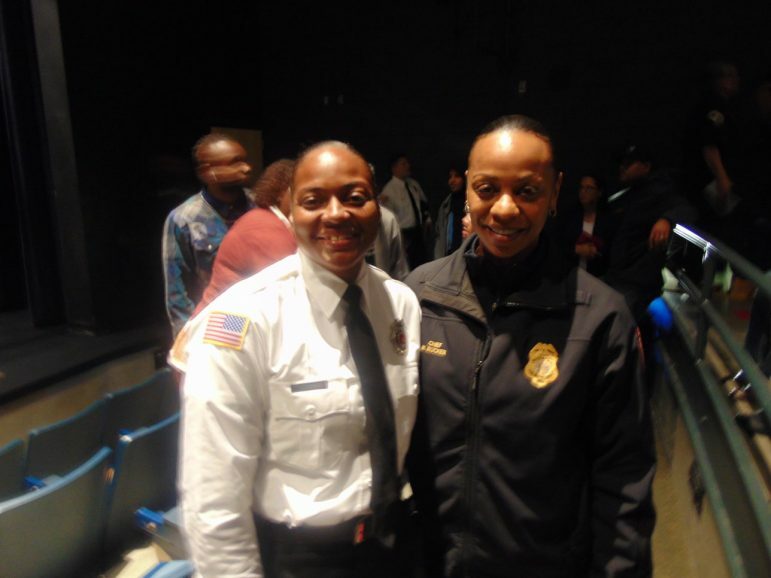 Terry became the city’s first Black female firefighter in 1995. According to its 2016 annual report, the Minneapolis Fire Department has 401 firefighters, 54 of them Black males. Seven of the 43 females are Black. “We [have] got to make sure that we continue to be in the fire department and [are] making sure that our community and our young people know that this is a career for us,” said Rucker on hiring more Blacks. Rucker says it is even harder for prospective Black women firefighters: “We have to push hard and to work extra hard, especially being a woman and an African American woman. It’s like a double-edged sword. Not only [do] you have to fight because we are female, but as well as being a Black female. “You get a lot of bigotry, a lot of kickback. To have that tough skin and courage is big. She [Baker] had to go through her battles to be the second African American female firefighter in the St. Paul Fire Department. We all have, but she got extra over here,” Rucker stated. “It’s definitely rough,” Baker said. “If it was easy, everybody would be doing it. When times got really hard for me, I just reminisced on things one of my mentors had to go through.” She was referring to Debbie Montgomery, the first Black female police officer in St. Paul, who attended the ceremony. Applications for St. Paul firefighters have closed for 2018, Hamilton reported. The next academy class is expected to start in January 2019. The one-hour public ceremony and cake and coffee reception afterwards was not only for the graduates but a celebration for their families and supporters as well. Charles, good day! Thank you for this informative and inspirational article. I’m glad that I came across it! I feel like you blessed my day: thank you, again!